It’s rhubarb season and we were given a generous bunch by a friend here in Oxford. I like nothing better than a good old fashioned rhubarb crumble. Though I hate it went they get all soggy and floury. So here’s my healthy version. It contains tonnes of oats and a few ground almonds to give that crisp yet nutritious crumbly crunch. Best known for its digestive properties, rhubarb is high in fibre easing constipation and promoting regularity. Full of antioxidants as well as vitamins K, C and A it helps limit age related brain damage, fight infections, improve vision and possible protect against lung and mouth cancers. And if that doesn’t convince you to include it in your diet, it also contains just as much calcium as milk! To make the fruit purée for this crumble, stew 4 cups of chopped rhubarb and 2 tbsp of sugar until soft. For the topping I use 1 cup of each – ground almonds, whole oats, and brown sugar, plus 1/2 cup of dessicated coconut. Place them all in a bowl and mix together. Now rub a tbsp of butter into the crumble mixture. 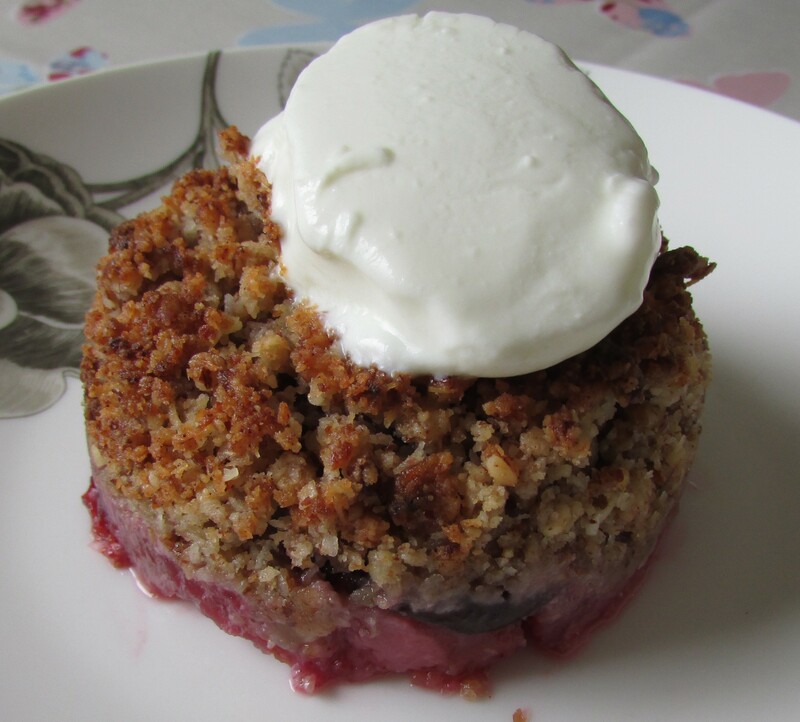 Put the stewed rhubarb into an oven proof dish and scatter the crumble on top. Bake in the oven for approx 20 minutes on 200C, 400F gas mark 6 until golden brown. Serve with natural yoghurt – delicious! This entry was posted in Frugal family recipes on May 13, 2015 by carolinementzer.